Our tactical molle Taser pouch is perfect for law enforcement, security, and prison guards that need to keep a stun gun with them at all times. BlueStone Safety's design has 4 snaps that secure onto BlueStone Safety Custom vest carriers and load bearing vests, keeping your Taser held securely in place and within reach at a moment's notice. 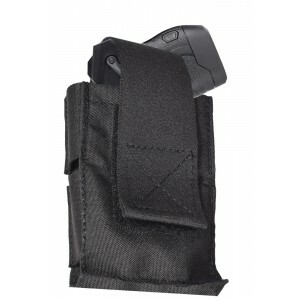 The taser pocket holds most standard size holsters including X26 and X2. Our Stun gun molle pocket is expertly stitched for quality and built to last. Proudly Made in the USA and backed by our 1 year warranty for craftsmanship. Keep protection within reach.